CASS does not only help eliminating paper work but also avoiding the hassle of going through vast number of unstructured paper forms. The large set of reports produced by CASS, gives the ability to concentrate on the analysis of results rather on the operation itself. CASS also provides a facility for applicants to select their preferences from a set of predefines options. The system then runs a placement and distribution function based on the highest score first service algorithm. 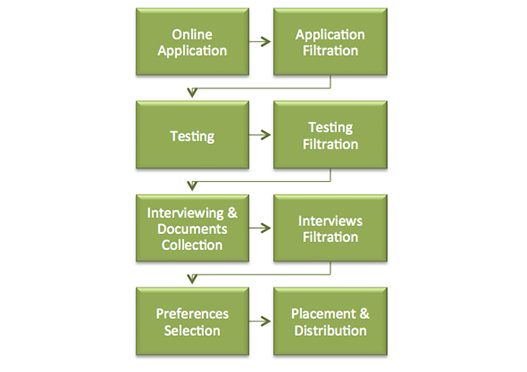 Same as after all filtration processes, applicants are informed about their application status by email. In addition, they can login to view their status on the web.